Data analysts expect a staggering $201 million dollars to be raised this #GivingTuesday, known as the single day dedicated to celebrating the start of the giving season. Every year on the Tuesday following the Thanksgiving holiday (and the “Black Friday” shopping rush), millions of individuals give to the philanthropic causes that are close to their hearts. We give with the intention of knowing that our donations will make a difference in at least one person’s life. But also with the reality that we won’t see that impact until months or maybe even years down the line. How often are we able to give and know that it will have immediate, direct results? A group of donors had this same question in mind when they reached out to the California Community Foundation (CCF) and established Pass It Along. Pass It Along was introduced to help individuals in need overcome roadblocks and obstacles that prevent them from reaching their full potential. Within 72 hours of making the request, recipients are awarded small, one-time grants that have life-changing results. The only requirement, is that recipients perform one act of kindness, however big or small, for someone in need. For David, the kindness of strangers who gave to Pass It Along meant being able to give his five children a home. Two years ago, the single father was struggling to make ends meet after being hurt on the job and losing his ability to work. It was not long before he could no longer afford housing and became homeless, his children forced into the custody of social services. David was determined to reunite his family. He sought help at Koreatown Youth & Community Center (KYCC) and was able to secure one of their permanent supportive housing units. But still, David needed a little extra help and applied for a Pass It Along gift which went toward the initial rent payment for their new home. As an added benefit to living in a permanent supportive housing community, David and his family now had access to supportive services to help them get back on track. He got help with tackling an exhaustive list of legal issues and other assistance to prepare him to be ready to go back to work. 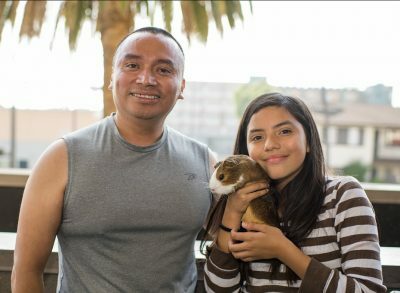 His kids joined KYCC’s afterschool leadership programs and gained skills to help them be able to take on the responsibility of caring for their new pet guinea pig. This year, David and his family are thriving. They will spend the holidays in their very own apartment, complete with all the comforts of home. David says he feels blessed; he and his children are happy and at peace. And he wants to pass it along by encouraging other families to have the courage to make a change. David’s story is just one wave in the ripple effect of kindness that has formed from Pass It Along. In the last ten years, Pass It Along donors have helped more than 670 families and 400 individuals at the moment when they needed it most, with grants totaling $1.8 million dollars. This #GivingTuesday, we invite you to help transform the future for a family like David’s through Pass It Along. For information on how you can help, please click here. And to find out more about Pass It Along’s impact please visit calfund.org/piastories.